As a volunteer at the Archives I have been processing the Herman Joseph Heuser papers, a manuscript collection that is part of the American Catholic Historical Society Manuscript Collections. Herman Joseph Heuser (1851-1933) was a Catholic intellectual and prolific writer who influenced scholarly circles and clerical life in the United States and abroad through his literary work. For thirteen years he aided in the editing of the American Catholic Quarterly Review run by his mentor Monsignor James Andrew Corcoran. 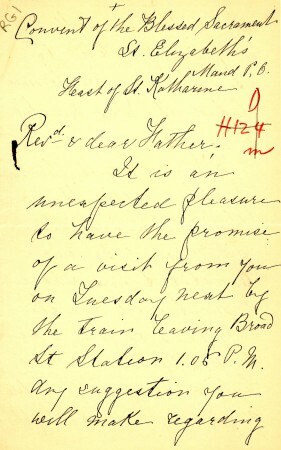 Heuser served as the editor of the American Ecclesiastical Review from 1889-1927, with a brief interruption from 1914-1919 when Reverend William Turner served as editor. 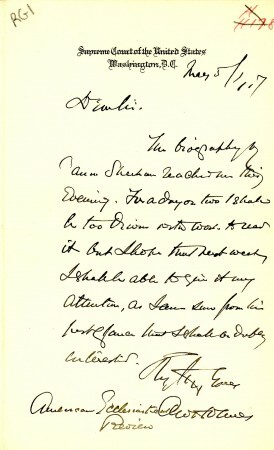 In addition to the AER he published The Dolphin, a supplemental Catholic literary magazine, from 1900-1908. He was ordained on February 2, 1876 becoming a full time seminary professor at the time of ordination and teaching at St. Charles Borromeo Seminary for over fifty years. 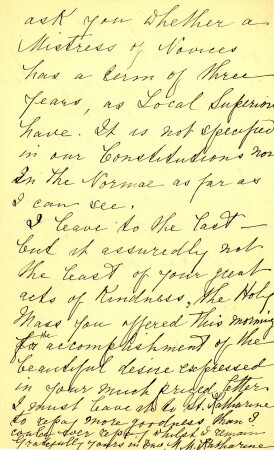 The bulk of the collection is correspondence, both personal and professional with the primary concern being articles in the AER or The Dolphin. Mother Katharine Drexel, Louise Imogen Guiney, Thomas Eakins, Leopold Stokowski, and Oliver Wendell Holmes are among some of the distinguished correspondents of Heuser. Katharine Drexel (1858-1955) was a nun dedicated to identifying and attending to the needs of Native Americans and African Americans and protesting the injustices of racism. Born to a family which owned a large banking fortune, Drexel used her wealth to fund missions and schools. She was beatified by Pope John Paul II on November 20, 1988 and canonized on October 1, 2000. 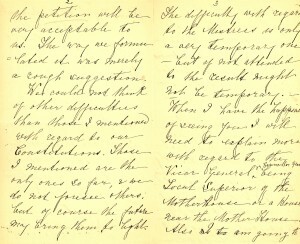 In the letter below Drexel asks questions about the new constitution for her order. 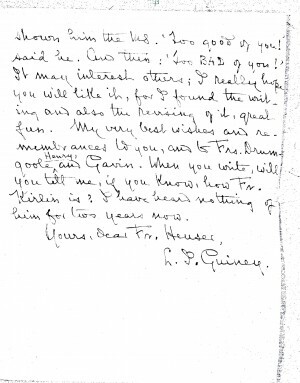 Poet and essayist Louise Imogen Guiney (1861-1920) frequently wrote to Heuser regarding her articles in the AER and The Dolphin. Below she asks that her piece remain unsigned. Thomas Eakins (1844-1916) was an American Realist painter. He studied and taught at the Pennsylvania Academy of the Fine Arts in Philadelphia and frequently painted portraits. 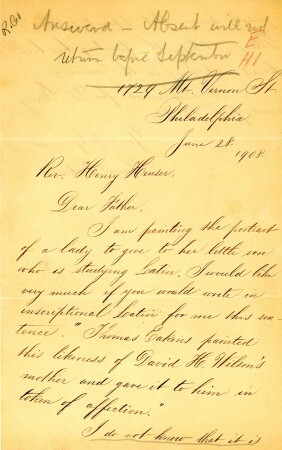 In this letter to Heuser, Eakins asks him to translate a phrase into Latin for a portrait of a woman who plans on giving the painting to her son who is learning Latin. He also mentions a portrait of Dr. Patrick Garvey he has painted in 1902, hoping it has been found and hung in the (St. Charles Borromeo) Seminary. Leopold Stokowski (1882-1977) was a conductor known for his free hand style. 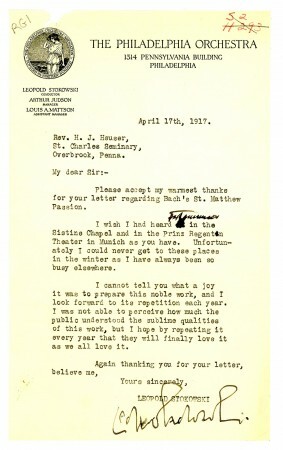 This letter thanks Heuser for his letter about Bach’s St. Matthew Passion and his hopes that performing the piece annually will inspire the public to love it as much as they do. Oliver Wendell Holmes (1841-1953) served as an Associate Justice of the Supreme Count of the United States from 1902-1932. 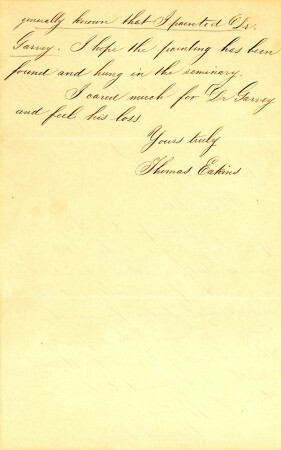 Holmes was concerned with Heuser’s work concerning Canon Patrick Augustine Sheehan, an Irish Roman Catholic priest who was an author and activist. 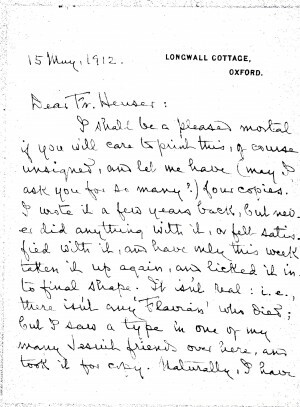 In this letter discusses Holmes reading proofs of Heuser’s biography on Sheehan, Canon Sheehan of Doneraile.